Tired of the Aero Basic non-glass look of Windows 7 virtual machines? With a few steps you can extend the glass experience to all your Win7 virtual machines running on Windows Virtual PC. 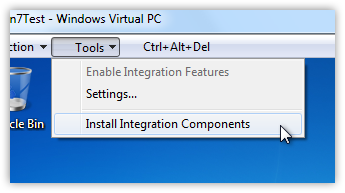 First, after you have installed Windows 7 in your virtual machine you need to install the integration components. Click on Tools and then Install Integration Components. Click through the installation on your virtual machine. After the virtual machine reboots, the final step involves enabling the integration components. Click on the Tools again and select Enable Integration Features. After you type in the user name and password for the virtual machine you should see the Aero Glass interface. If for some reason you do not simply select an Aero Glass theme by right clicking on the desktop and selecting Personalize.